The InLoox PM options support you with a central customer management. Create a new customer system-wide in the InLoox PM options as well as in the project directly. 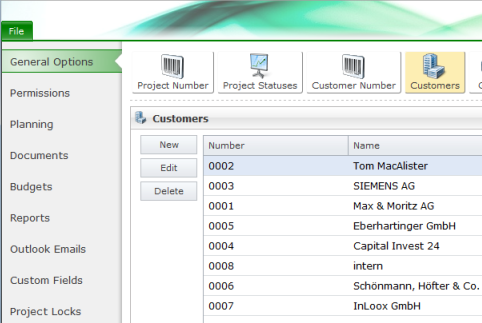 Insert a new customer in InLoox PM Web App by clicking New. In the New customer dialog box enter a name in the Name box. InLoox PM Web App automatically assigns a number to the new customer. For more information on how to change a customer number format, see Adjust the customer number. Change the name of an existing customer. Choose the respective customer from the list and click Edit. Remove a customer from InLoox PM Web App by clicking Delete. The renaming of a customer takes immediate effect in all relevant projects. The deletion of a customer takes immediate effect in all relevant projects. Create and manage a customer - InLoox • Copyright 1999-2019 © InLoox GmbH. Reservados todos los derechos.